Offshore wind power is a primary technology helping to meet the global low carbon challenge. With costs falling, deployment of offshore wind and employment in the sector are rising dramatically. This places an obligation on operators to observe the very highest standards of health and safety. 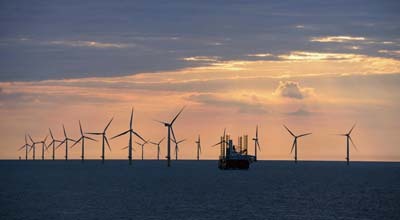 The Global Wind Energy Council (GWEC) estimates that the end of 2016, nearly 88% of all offshore wind installations were located in waters off the coast of European countries The remaining 12% of the installed capacity is located largely in China, followed by Japan, South Korea and the United States. The first US offshore wind farm came online last year, there is renewed push in China, and an ambitious programme in Taiwan. The European offshore wind industry added 1,558 MW of new capacity in 2016. Europe’s cumulative installed capacity at the end of 2016 reached 12.6 GW. Six wind farm projects were completed in 2016, and eleven projects reached Final Investment Decision. The big story in 2016 is the dramatic reduction in offshore wind prices. In some circumstances offshore wind is cheaper than onshore wind, an unprecedented circumstance resulting from the maturing of the industry, the improvement and maturation of the technology/management, growing investor confidence and the new generation 6-8 MW WTGs.